This is an elegant bathroom sink enclosure using our custom glazed sink undermounted with trim tiles to fit. 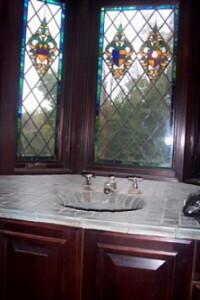 Countertop molding is used as a finish. The stainglass work fits nicely in this room.